Those blue menus of old? They're gone in the fall Xbox Live update. In their place are silvery white menus. Xbox Live's keyboard gets tweaked, too. "We've taken the existing QWERTY keyboard in-dash and made it easier to use for scenarios that involve repeated text entry," Microsoft's Larry Hryb explains, "when signing up for LIVE within the dashboard for example." Sent a quick message to Fahey, and I didn't get a chance to really check out the "repeated text entry" yet. The keyboard seemed easier to control with the thumbstick, but that could be because it is easier to read than the previous blue keyboard. Update: No, this is not technically a QWERTY keyboard. 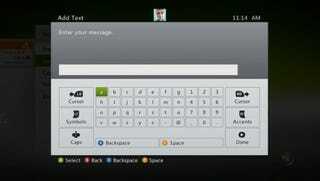 If there's an option to convert the alphabetical keyboard in the Xbox into a QWERTY one, we haven't found it yet.